Yet another LibriVox pick but my first Mary Roberts Rinehart. A dame walks into lawyer Jack Knox’s office and asks for help. Her father Allan Fleming, a prominent politician, has disappeared. She’s nervous. Her father’s house has been broken into and a mysterious note with the numbers 11-22 left behind. What does it all mean? She begs Jack to find her father and not involve the police. Jack falls instantly for the lovely Margery Fleming and agrees to help her. Unfortunately, she’s engaged but the lucky man seems to be up to his neck in her old man’s dirty business. He knows more than he’s letting on about the missing Mr Fleming. Things get stickier when Margery’s Aunt Jane disappears along with the family pearls. The stakes just got higher. As Jack starts putting two and two together, everything points in the direction of the political club The White Cat. The White Cat is a place where shady deals are made across poker tables. A man’s career can be made or broken here. It’s also the kind of place a man can lose his life. 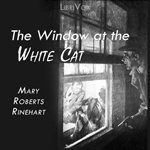 I decided the try The Window at the White Cat by Mary Roberts Rinehart story because Aarti and Tasha had success with their selections of the same author. I think I picked the wrong book. The Window at the White Cat had its good points but I wasn’t enamoured with the story. In fact, I found that I would drift off while listening or wonder what exactly was going on. It was the political side of the story that I didn’t care about. Allan Fleming is a crooked politician, I didn’t really care about him or his cronies. Maybe sleazy politicians and their dealings would have interested readers in 1910 but we’ve all done that and bought the t-shirt. Now Miss Jane on the other hand, that part of the story, a sort of sidebar to Fleming’s story, was much more appealing. What happened to the lady? I wanted to know. I did like Jack, with his dry sense of humour and his interesting home life. Jack is that artifact of the last century, the sad bachelor. He lives with his brother, sister-in-law, and their kids. He endures their ribbing and his brother’s grumbling. Jack tries to be Margery’s hero by finding her father but most of the time he’s bumping into people or things in the dark. There are a lot of people breaking into houses and tumbling over each other in the dark actually. Jack also suffers from “don’t worry your pretty head” syndrome when it comes to ladies. What is with these guys trying to shelter pretty women from bad news? What are they scared of? Are they afraid they’ll lose their marbles and jump in a lake? So annoying. Anyway… Margery is kind of blah herself. All she has going for her is looks which I guess is all that’s necessary in a love interest. She’s the least interesting of all the characters. From the looks of other reviews out there, this might be one of Rinehart’s duds. I’m willing to give her another shot. There was potential in The Window at the White Cat but the execution was off. Any suggestions for other books? This was an LibriVox recording performed by Robert Keiper. He was so good! The voices he did for each character were hilarious. He really livened the story up. I would listen to his other recordings. The Seventh Man looks like a good one.